This appetizer makes an appearance at many festive gatherings. It is easy to prepare. You can make these into sandwiches by adding your favorite cold cut(s) and leaving the resulting wraps whole. Combine the softened cream cheese and spices in a small bowl. Stir in the chopped green chile until well combined. Spread the mixture on the tortillas. Roll the tortillas up as tightly as possible, and wrap each in plastic wrap. Chill for at least one half-hour. Remove the tortilla rolls from the refrigerator. 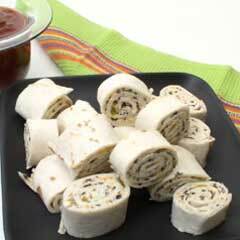 Slice each roll into ½-inch slices. Place the slices on a serving platter.